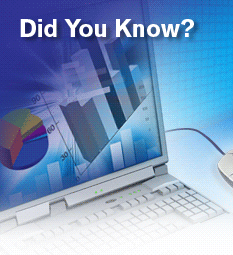 Did you know there are up to 12 years of historical data within the Research Wizard? As a convenience, every time you create a screen within the main screening database and then backtest it, it�ll automatically toggle into the historical backtesting databases. But you can access these and other databases on your own for a variety of screening and reporting purposes whenever you wish. 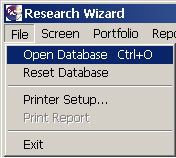 First, let�s take a look at all of the different Zacks Databases that comes loaded with the Research Wizard. 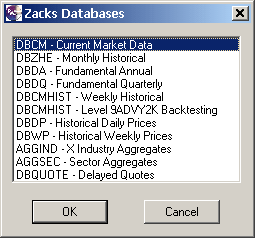 The following is a list of available Zacks databases. DBCM: This is the default screening database and is updated daily. DBCMHIST: This is the main backtesting database. For screening purposes, it contains five years (260 weeks) of historical data for screening. For backtesting, it can contain as many as 10 years (in weekly data points) of backtesting data based on the user�s subscription level. DBZHE: Monthly Historical database containing data for fundamental estimate and ratio items for entire universe. DBDA: Fundamental Historical Annual Data database containing annual income statements, balance sheet and cash flow items; 10K data going back 12 years. DBDQ: Fundamental Historical Quarterly Data database containing quarterly income statement and balance sheet items; 10Q data going back six years (24 quarters). DBDP: Daily Historical Prices database containing 560 days of daily price information. DBWP: Weekly Historical Prices database containing 625 weeks of weekly price data. DBQUOTE: Intraday (15-20 minutes delayed) prices database. AGGIND: Aggregate Industry database containing current fundamental data aggregated by Zacks Expanded Industry Groups. AGGSEC: Aggregate Sector database containing current fundamental data aggregated by Zacks Expanded Sector Groups. 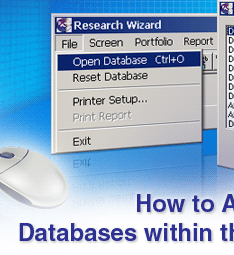 Accessing the different databases is easy. On your Menu Bar, go to File and then Select Open Database. 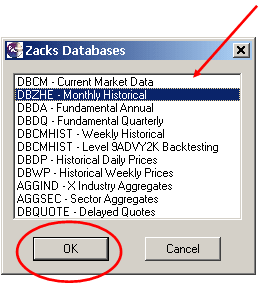 To open any one of the different databases, just select the one you want and then Click Ok.
For this example, let�s select the DBZHE � Monthly Historical database, then click OK.
Once you do, the main Research Wizard page will reappear with the new database loaded. As you explore the different items available in the different databases, you�ll often see numbers inside of parentheses to the right of an item�s description. For example, while still in the DBZHE database, select Price and Returns in your Categories window and then Month-end Price under Price in the Items window. To the right of the item, you�ll see (144 Mth). That simply means there�s 144 month worth of monthly data points available to access to screen or report on. Beneath there for example, you�ll see the item Beta (60 months) (48 Qtr). The �48 Qtr� means there�s 48 Quarterly data points that you can access for this item from this database. To switch to another database, repeat the steps from above. 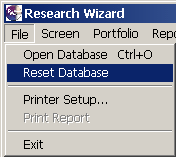 As a shortcut, to switch back to the main default DBCM screening database, just go to File on your Menu Bar and select Reset Database. This will take you back to the main DBCM database as shown below. A screening and backtesting tool is only as powerful the database(s) that it runs on. 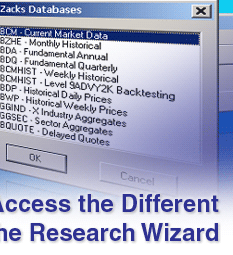 With the Research Wizard, there�s over 650 different data items to pick and choose from and a virtual infinite number of custom calculations one can create on their own. And this is all made possible due to the various databases available in the Research Wizard as well as the depth of historical data you have access too.